Some contrasting images from a recent Walksweek with three guests from Minnesota and Oklahoma. We set off on a blustery morning for our first walk together above the little village of St Basile. 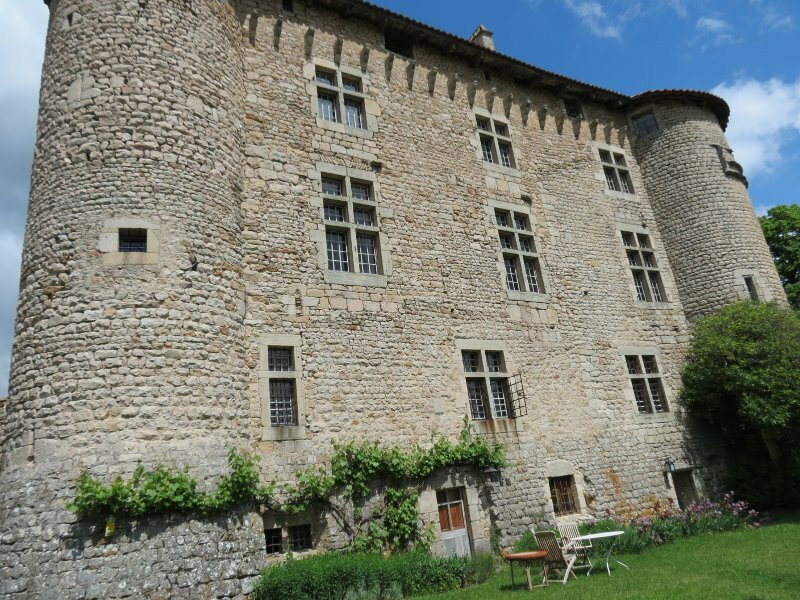 Our first glimpse of the Château of Maisonseule. 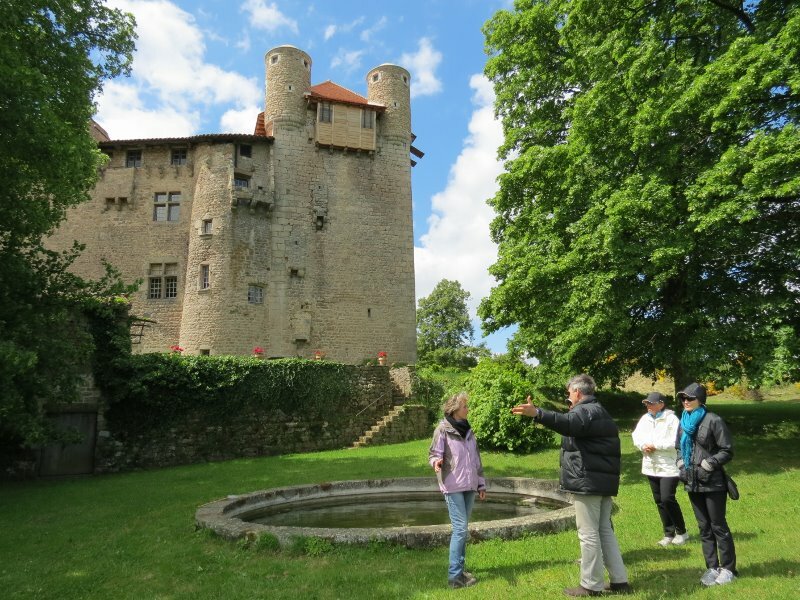 We were invited to take a private tour of the castle, with Kate acting as interpreter. It is truly impressive . . . .
From the Renaissance West facade . . .
to the powerful Medieval defensive towers. Inside there were welcoming fires and we heard fascinating stories about the castle and its history. 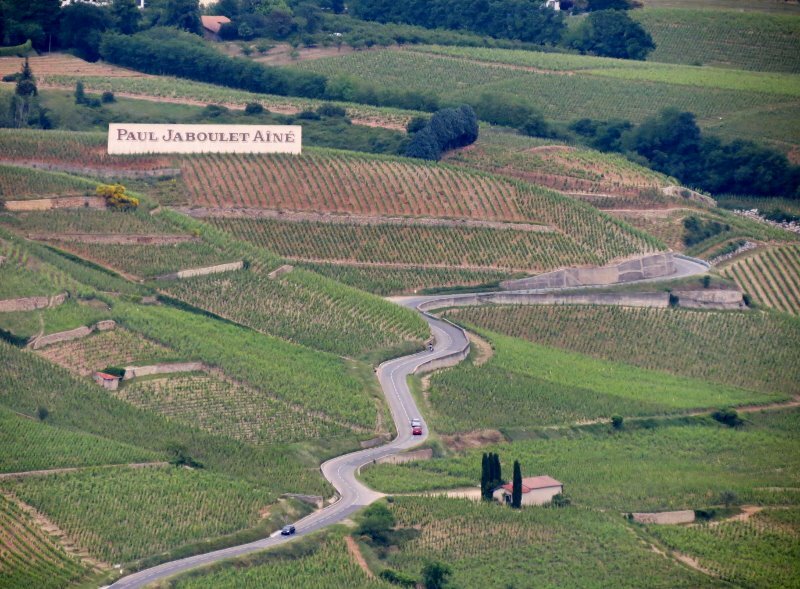 A few days later we were in the vineyards of the Côtes du Rhone. 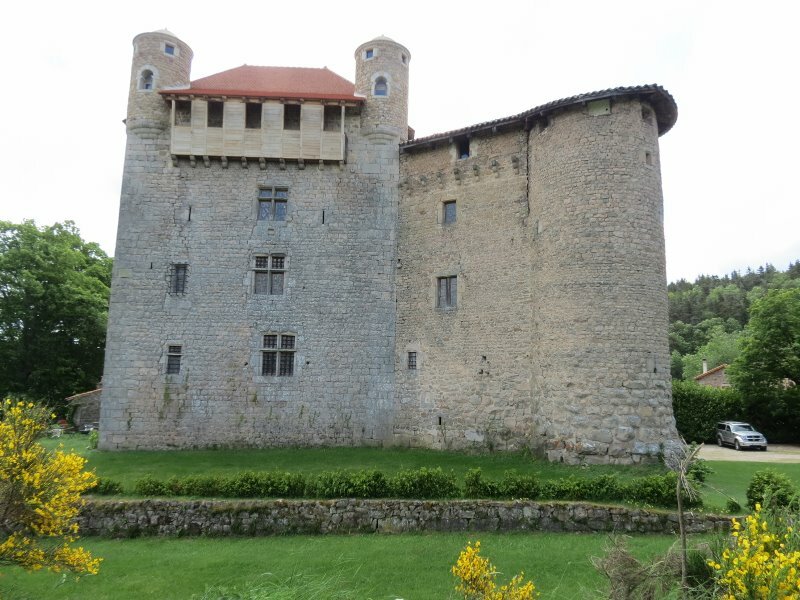 Our hiking route took us through the famed Crozes Hermitage and Hermitage parcels, with frequent stops at information panels. There was a quiz at the end and our Walksweekers scored highly and won a little prize! 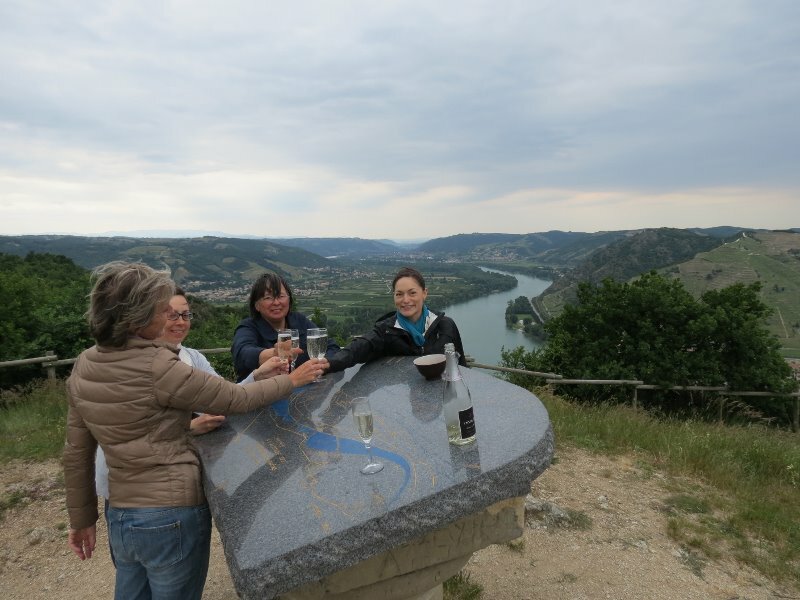 The weather had definitely warmed up and after a good day’s walking, winetasting, shopping and sampling delicious Valrhona chocolate, we rounded things off with a glass of bubbly at a spectacular viewpoint. 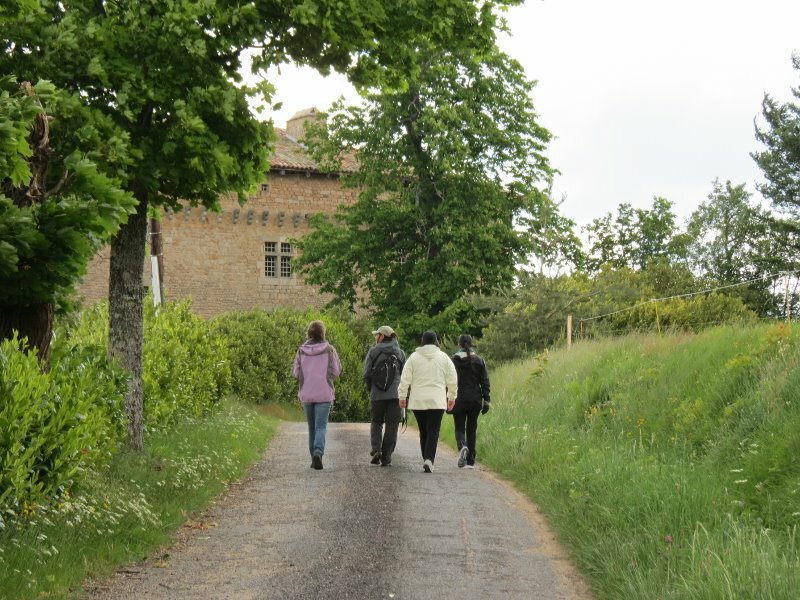 On another excursion our intrepid guests set out from les Sarziers towards Boucieu le Roi with instructions to “Hunt the Hamper” for their special picnic lunch. 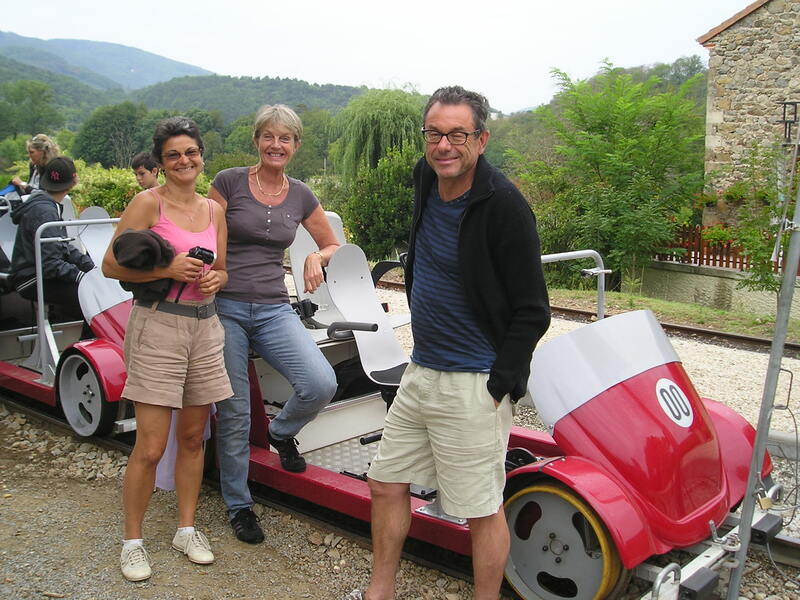 They found it in a shady spot by the river and after a restorative break continued to the station, where they boarded their vélorail pedal car for an exhilirating ride down the Doux Gorge which turned out to be full of thrills and surprises! 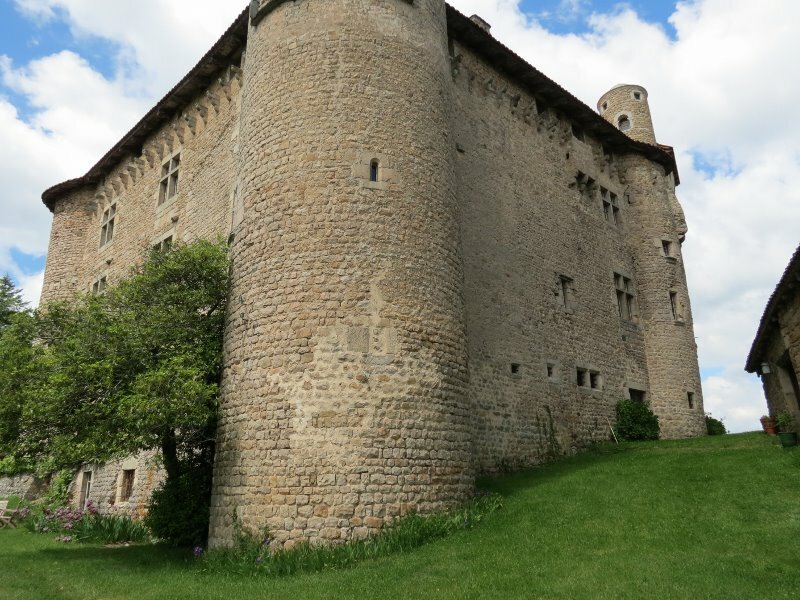 With a visit to the market in Lamastre, convivial dinners at les Sarziers and a varied choice of hikes and activities each day, it was a great week. Our guests had chosen a Walksweeks Your Way and we have decided to concentrate exclusively on this formula for the future as it gives great flexibility to plan the week and enjoy the very best of our very special area …. your way! 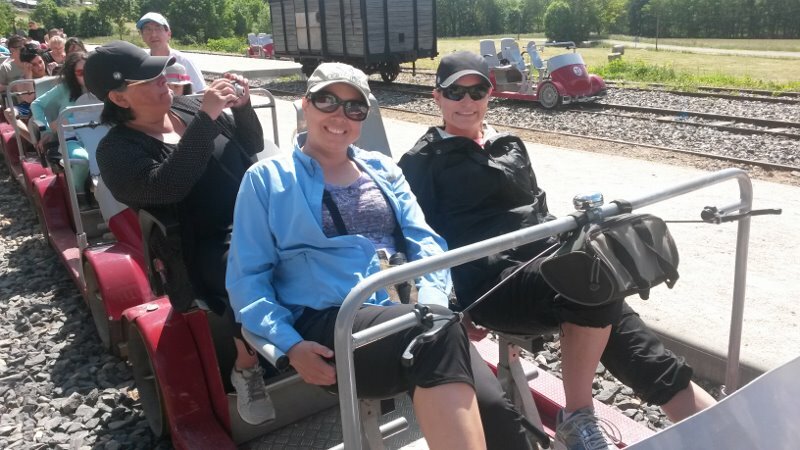 We are delighted to learn that the ever popular vélorail is expanding its service for the 2015 season. 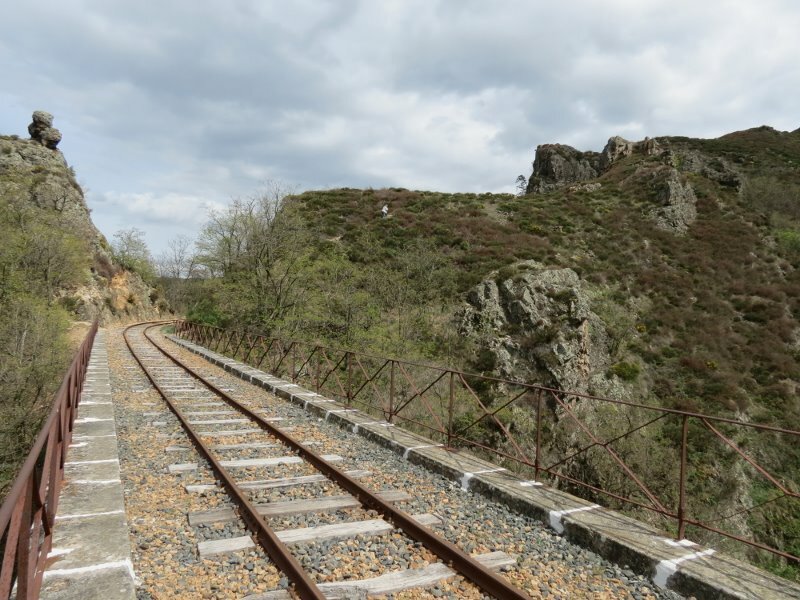 The section of line which runs through the Doux Gorge is already somewhat over-subscribed, with up to five velorail and three steam train runs a day in the high season, all competing for the same stretch of track. 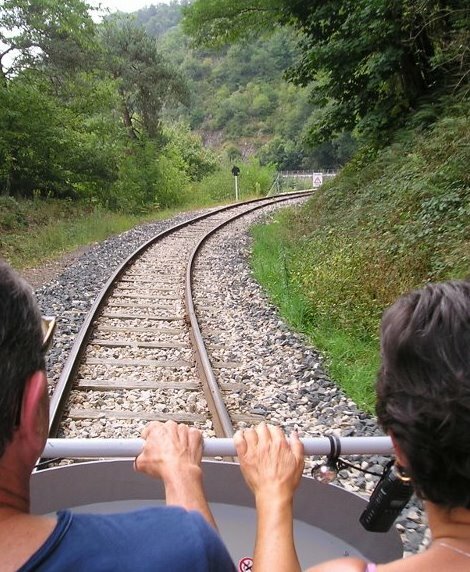 We have always felt that the continuation from Boucieu to Lamastre is as yet under exploited, since it is only used by the Tuesday market train and for a few extra runs from Tournon to Lamastre in July and August. The re-opening of the line has been a great success; but this summer there was inevitably a bit less of a buzz after the triumphant first season in 2013. Le chef, invaluable as he undoubtedly was to the smooth running of the operation in those first hair raising months, seems to have proved to be a little too independent-minded for management and there was a parting of the ways at the end of that year. We were also a bit anxious that one of the operators, Kleber Rossillon, might have been a bit distracted having been awarded the prestigious contract to operate the Grotte Chauvet in the south of the Ardèche, which is set to open in April this year, but it seems that our fears were unfounded. 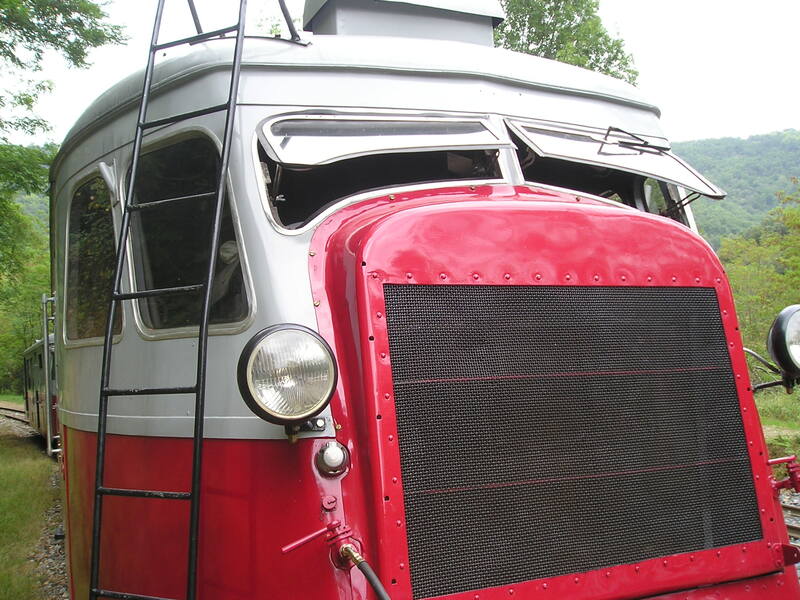 A second steam locomotive has been rebuilt and will be ready for service at the start of the season and 25 new pedal cars have been ordered for the vélorail service. These cars are manufactured by a small local company just 30 miles to the south of us, which is particularly satisfying. We were delighted to host our friends and staunch supporters Jane and John for a recent Walksweek. As walking companions they brought along Julia Donaldson and her husband, old friends from Bristol University days. This was our last Spring Walksweek before the Summer gap, when the weather is often too hot for walking. We still have availability in September, a wonderful time to experience the changing late summer colours in the woodlands and orchards. Julia was definitely here on holiday rather than in her public persona, but we know how popular Le Gruffalo is in France and she kindly signed a few copies for the children of our friends. 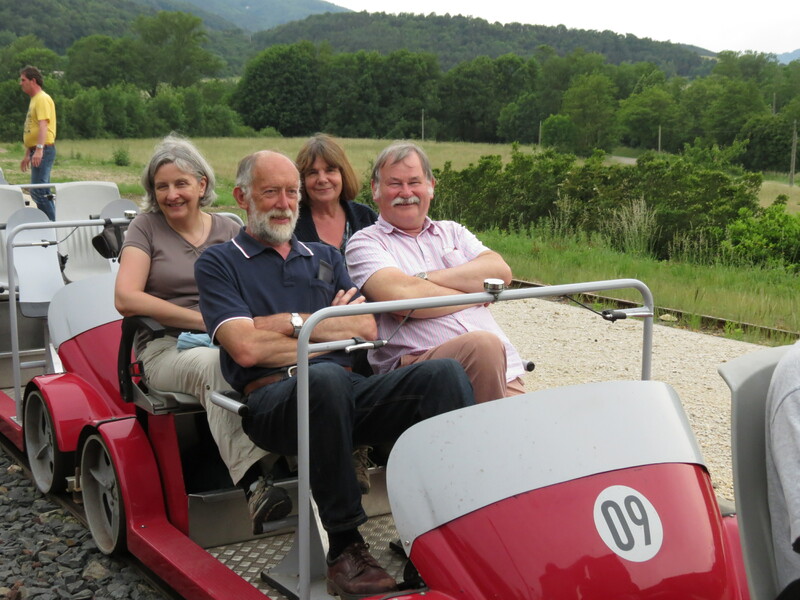 After an alarming misunderstanding, when they got the impression that they were about to embark on a roller coaster ride down the Doux Gorge, everyone thoroughly enjoyed their trip on the Véorail. Pedalling makes a change from walking! Julia draws on her own experiences as the inspiration for her stories, so we will be watching out for a tale of a quick-thinking mouse on a pedal car outwitting all and sundry! 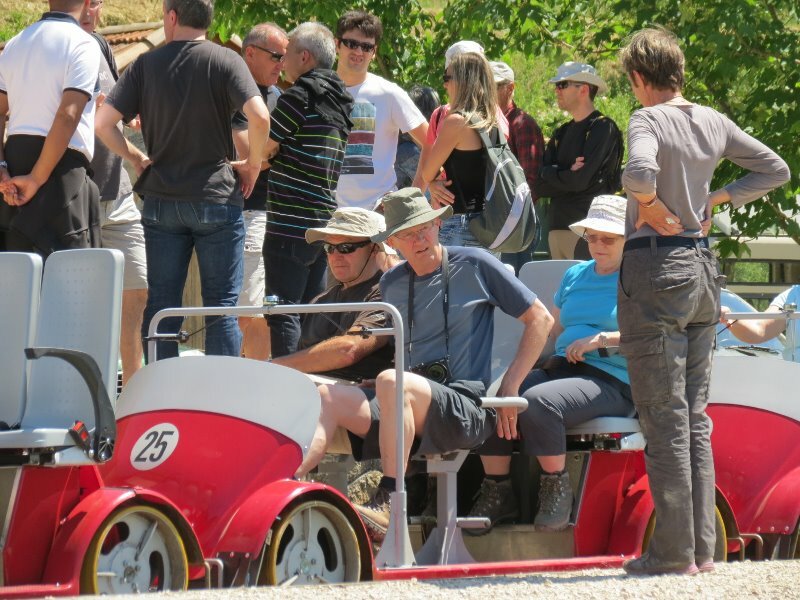 The little station at Boucieu le Roi is buzzing with life once again. Two years after the sudden discontinuation of the steam train, the much-loved Mastrou, its platform is humming with life, the level crossing barrier is back in action and we hear the familiar toot toot of the diesel autorail as it makes its way back up the valley. The service is booked up solidly until the end of October, but last Saturday we were able to sneak abord number 00 for our trial run. We were very excited to be the first ones to set off down the line, and our valiant pedallers were so enthusiastic that we arrived in record time, having encountered goats and a couple of chickens on the line, waved at fishermen in the Doux and paused for a moment to admire the splendid bridge over the narrows. 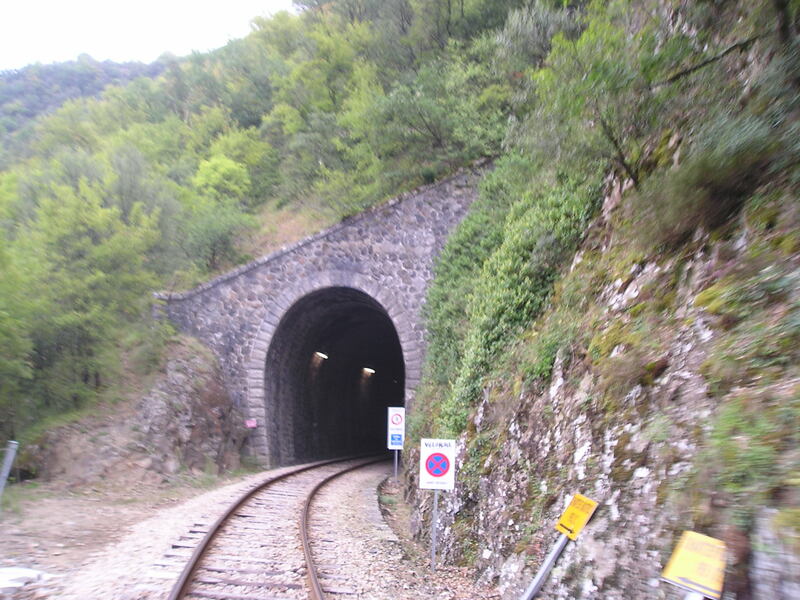 Then it was into the tunnel and away down the gorge. This is the most spectacular, and least strenuous, part of the trip. We know the line well of course, having used both the steam and diesel service regularly for many years whilst it was still operating, but this open air experience gives you a completely different impression of the landscape and the incredible feat of engineering which was necessary to carve a railway line through this dramatic gorge. The run is truly spectacular, passing through a completely unspoiled and largely uninhabited valley, which is otherwise absolutely inaccessible. 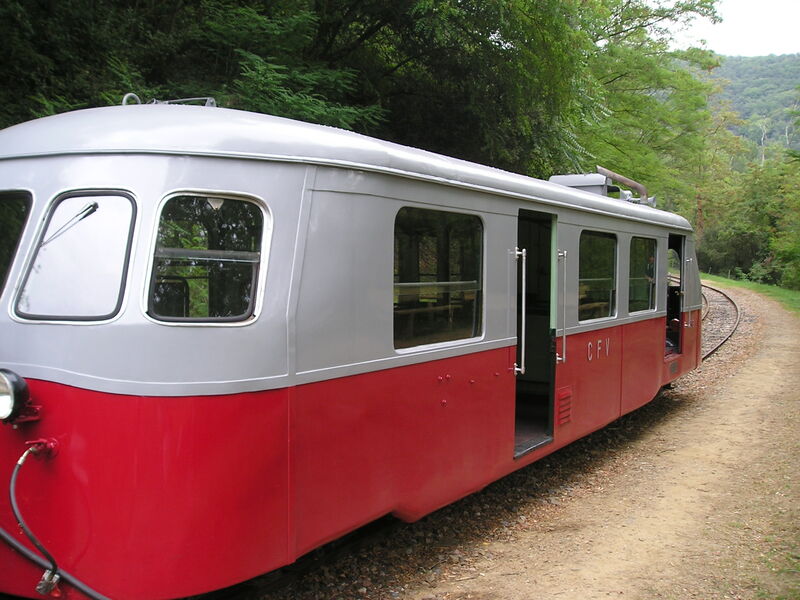 Once the whole convoy of twenty pedal cars had arrived at the little station of Troye, everybody boarded a double autorail dating from the 1930’s and completely renovated last year. The line of cars was hitched on behind us and we trundled back up to Boucieu. A great morning and a fantastic addition to Walksweeks. We know our guests are going to love it! 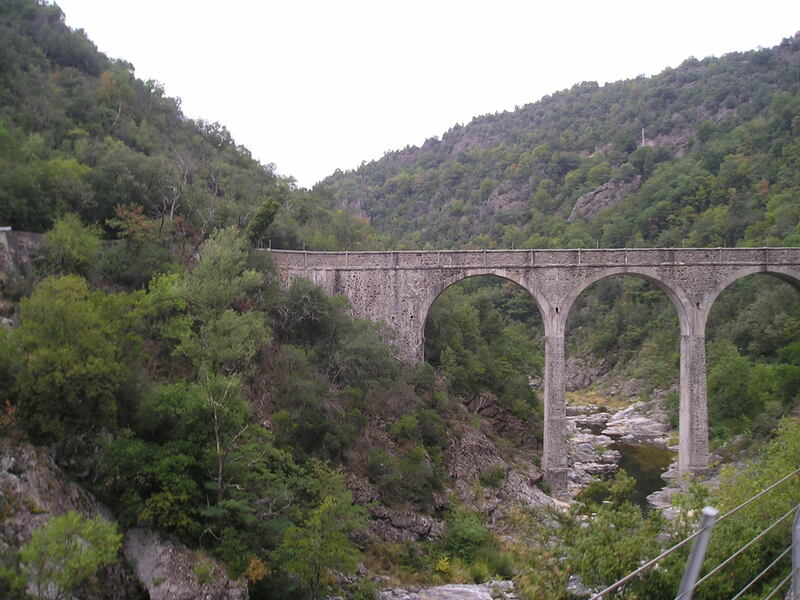 At last it is possible once again to travel down the Doux Gorge on the railway line! 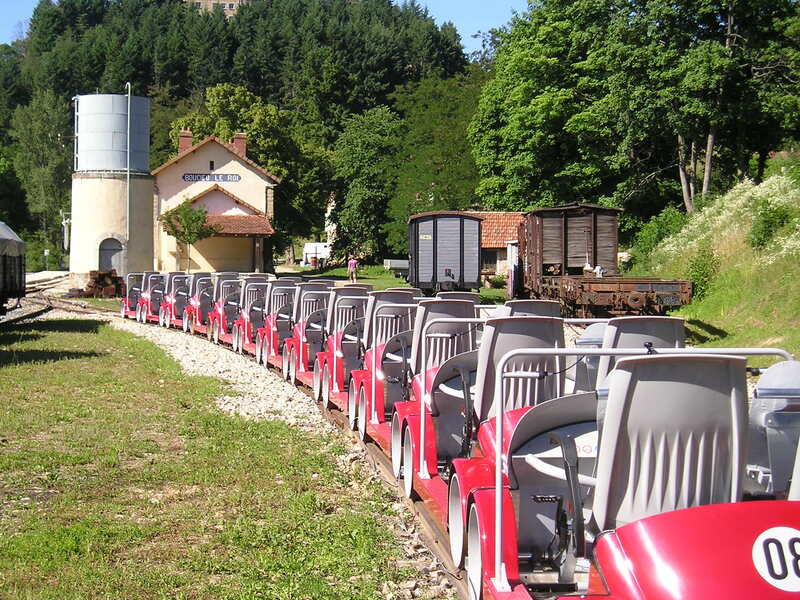 These are the vélorail pedal cars which have just started operating, as a first step to restoring full resumption of the Mastrou steam train service. The cars seat four people, the front ones pedalling and the rear passengers just enjoying the view! 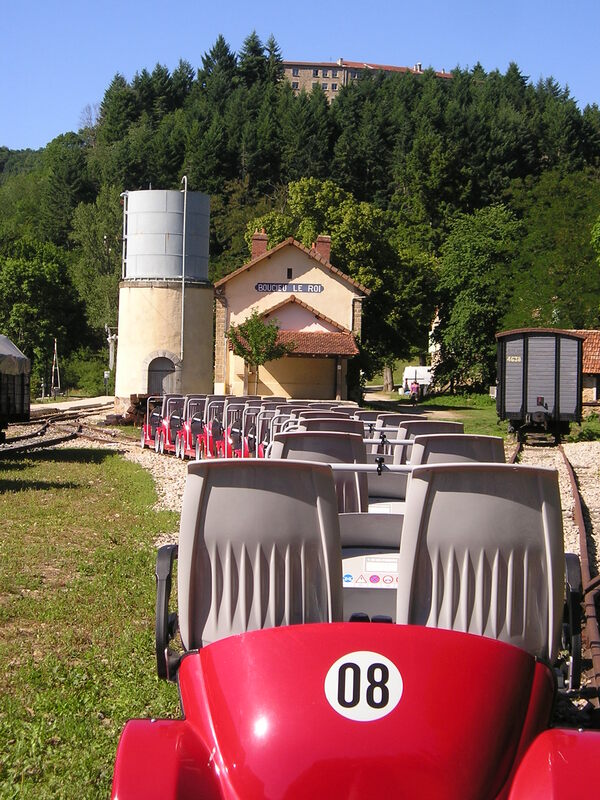 You start at Boucieu and travel all the way down the gorge to the Gare de Troye, before Tournon. 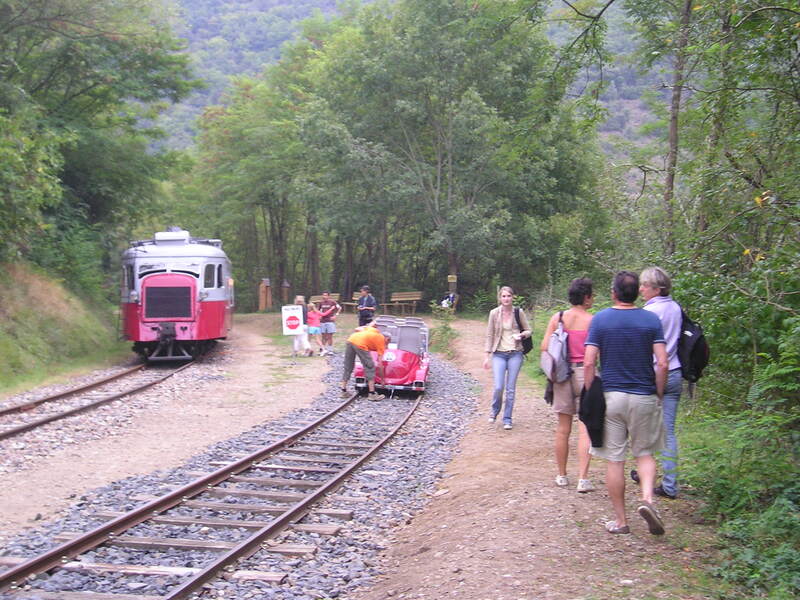 There, one of the diesel trains from the 1960’s brings all the passengers back up to Boucieu. 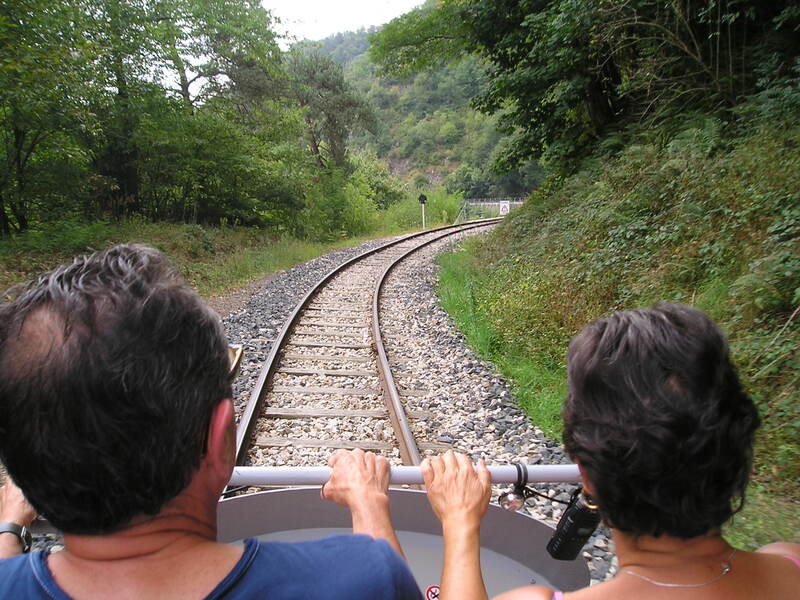 We have not yet tried it out, but it looks like a lot of fun and, although we are still a long way from normal service, it will be exciting to experience the dramatic gorge from one’s own little cart, rather than from the train carriage. Can’t wait to have a go! The Return of the Mastrou? WHAT is this?? Certainly not the lovely steam train which we have all been missing so much since it suddenly ceased operating two years ago! But the news is encouraging. After protracted wrangling, mud-slinging and court hearings plans are on track to re-start the service through the Doux valley. 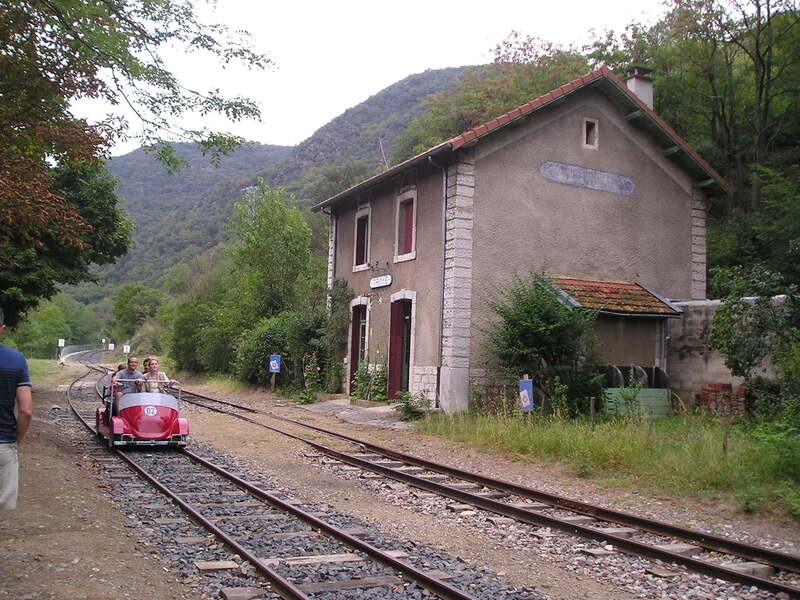 The tentative date is Spring 2011, but there is much work to be done before then, overhauling the five steam locomotives, maintaining the track and infrastructure and even building a brand new station at St Jean de Muzols, the new departure point for the Mastrou, which will do away with the need to share the main SNCF line to cross the river – always a scary moment! All summer we have been hearing the friendly sound of the horn as the diesel locomotives make periodic inspection runs along the line and one day we came upon this bizarre sight. 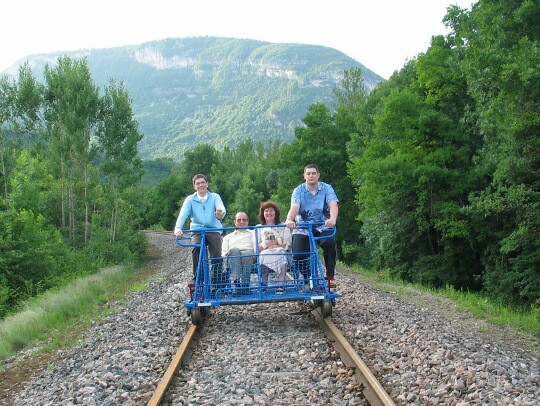 It is a “velirail” – a sort of pedal car on rails which may be offering rides before the line is fully open for train business again. As it is a single track line, you certainly would not want to come nose to nose with a steam powered Mastrou bearing down on you as you pedalled along!